Occasionally as a child grows up an adult tooth may not erupt for various reasons such as angulation, crowding, and excessively thick gums. During orthodontic therapy an attempt may be made to move an impacted tooth into its proper position. 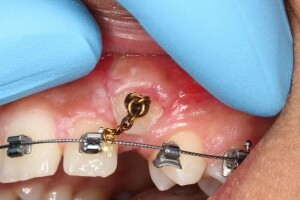 Occasionally this requires the unerupted tooth to be exposed to allow for an orthodontic appliance to be attached to it. As periodontists, we specialize in understanding the relationship of various types of gum tissues in the mouth and we work very closely with your orthodontist in order to achieve favourable results. When we exposure a tooth, we ensure that an adequate amount of thick protective gum tissue is located around the tooth. 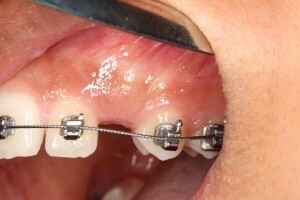 This may take several procedures during and after orthodontics to achieve. This will lead to better esthetics and facilitates long term maintenance of the tooth after completion of the orthodontic treatment.